If you grew up as an RPG fan, it’s highly unlikely you’ve made it this far without hearing or playing through one of Bandai Namco’s Tales games, such as the amazing Tales of Symphonia. This year marks the 15th year the series has been around, and rightfully so, a celebration is being prepared in its honor. On an announcement page opened today by the publisher, an impressive six of the previous Tales games will reappear on store shelves on August 4th. Four of the six games, including Tales of Phantasia, Tales of Eternia, Tales of Destiny, and Tales of ReBirth, will be released for the PSP, while the remaining two, Tales of Vesperia and Tales of Graces, will be hitting the PlayStation 3. 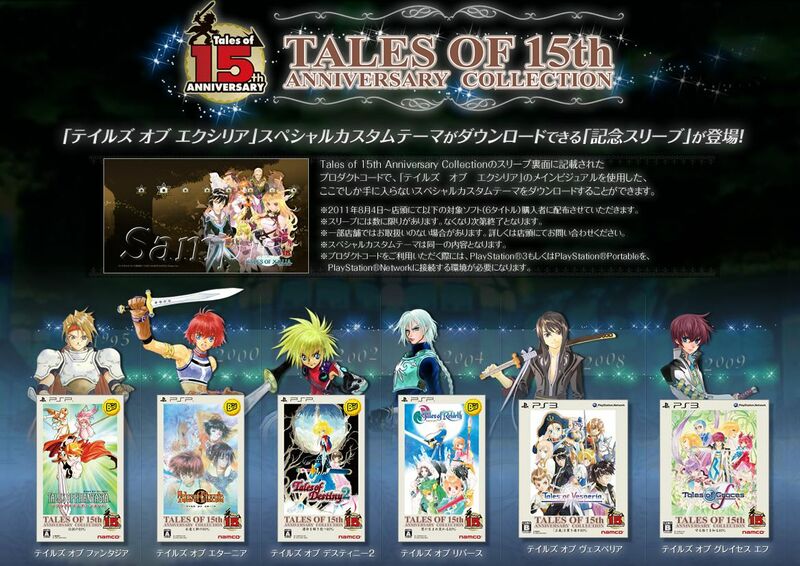 As a bonus, each of the games will reportedly have a Tales of 15th Anniversary Collection game sleeve and a product code on the back cover to download a custom XMB theme, seen in the image below. No indication on regions of release for these, but having never made the jump stateside, Bandai Namco may take this opportunity to finally give us a a North American release of Graces.